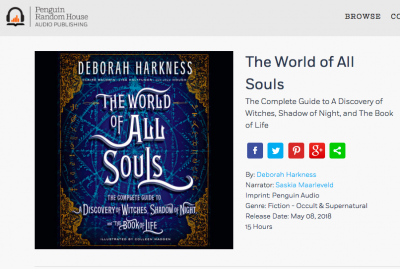 Did you know you’ll be able to *listen* to THE WORLD OF ALL SOULS? It’s true. 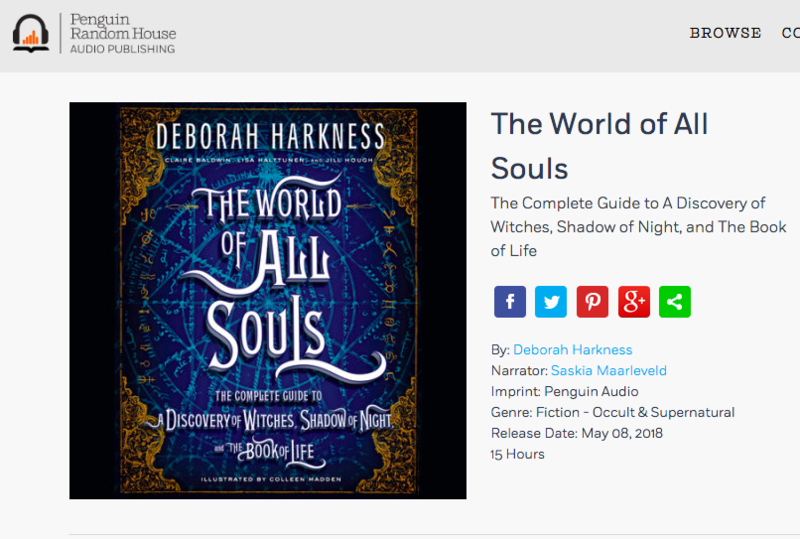 There will be 15-hour audiobook version of the companion guide to A DISCOVERY OF WITCHES, SHADOW OF NIGHT, and THE BOOK OF LIFE. It will be released on 8 May, the day same as the hardbacks will be available in the US, UK, and their sales territories. And yes, it will be available through Penguin Random House Audio, as well as your other favorite retailers, and through Audible. So how do you do an audio version of what is essentially a very beautiful encyclopedia? Like the book itself, the audiobook has been a collaborative venture. We have a new narrator, the marvelous New Zealand-born actress Saskia Maarleveld, who has recorded many audiobooks including THE ALICE NETWORK and WHEN PARIS SIZZLED. Jennifer Ikeda, who narrated the trilogy, wasn’t available for this project but I was thrilled that Saskia was. The moment I heard her work, I knew she was the perfect person to bring this book to life. There are also a few cameos from me (!) and we were fortunate to have British-born actor Steve West give voice to our ancient and classical literature. Because THE WORLD OF ALL SOULS is so visual, with more than 500 drawings by Colleen Madden, we had a think about how we might give listeners something emotional and evocative to replace the illustrations. I was absolutely delighted that Isaias Garcia, an award-winning Canadian composer who has written marvelous music inspired by the trilogy, agreed to let us feature his work on the audio book. There are also sound effects to signal important elements in the text (like historical figures, etc. ), excerpts from the original trilogy recordings by Jennifer Ikeda, and it will come with a 70+ page PDF including things like recipes that we just couldn’t figure out how to deliver to you any other way. We are very excited about this highly creative and collaborative audiobook. It takes the creative collaborative work of the companion itself to a whole new level. We hope you like it! Daughter of Rebecca and Stephen, and wife of Matthew Clairmont. A weaver. From the All Soul's World Trilogy by Deborah Harkness. Released by Viking in the US, and by Headline in the UK (and all its sales territories), on this day in 2018.